I am going to talk something that I got really excited about as a tool that you must have if you are into IT support. The tool is a Microsoft built tool named XPERF. Xperf is an advanced troubleshooting tool that digs deeper into performance issues than Perfmon ever dreamed of. It is part of a product suite called the Windows Performance Toolkit (WPT), which is part of the Microsoft Software Development Kit (SDK). Xperf leverages Event Tracing for Windows (ETW), a built-in component of the server operating system that provides detailed performance and system data. The Xperf utility excels in troubleshooting areas like responsiveness issues, slow boot times, high CPU and disk usage, application delays and slow transitions. It’s supported across x86, x64 and IA-64 architectures with less than 2.5% CPU overhead while gathering over 20,000 events per second. In other words, this is one tool you’ll definitely want to add to your toolbox. 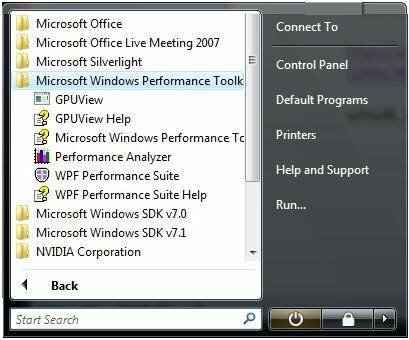 But before we get into the many features Xperf has to offer, let’s first go through a short tutorial of how to install and use the tool for troubleshooting Windows performance issues. 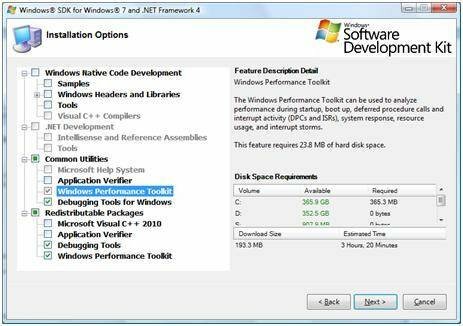 As previously mentioned, the Windows Performance Toolkit is distributed with the Windows Software Development Kit. To install the SDK, however, you must first install Microsoft .NET Framework 4. Unless you want to install the entire 4 GB SDK, you should only select the Windows Performance Toolkit and the Debugging Tools for Windows options, as shown in Figure 1. Note: Extensive online help is available that explains each provider in detail. By hovering your mouse pointer over a particular line on the graph, additional details will be provided such as the name of the process that is accumulating all the CPU time. For instance, in Figure 3 you can clearly see how the antivirus process Rtvscan.exe is dominating the CPU usage. Another nice benefit of using Xperf is the ability to zoom in on a particular time range to take a closer look at the graph. In Figure 4, you can see the Disk Utilization graph shows a spike in activity after the first 60 seconds. Zoom in on the time period in question by using the mouse pointer to click and drag over that area of the graph, then right-click and choose Zoom To Selection. This will produce another graph for just the time period you specified. To revert to the original graph, right-click the graph and select Unzoom. To get even more detailed, you can right-click a graph and select Summary Table. This will produce a chart that documents all the corresponding counters and data associated with the graph. For instance, Figure 5 illustrates the Disk Summary Table for the Disk I/O graph. Line 1 of the chart clearly shows how the Rtvscan.exe process is accumulating massive read counts, which would be expected for an antivirus scan. As you can see, Xperf is a very powerful and intuitive tool that can really help you drill down on performance issues. I have just touched the tip of the iceberg with regards to Xperf’s capabilities, however, as the tool is also great for slow boot investigation, high kernel and interrupt times and hot file analysis. Each of these areas alone deserves its own discussion of the features and benefits.